In June 2010, Vancouver police constable Taylor Robinson shoved a disabled woman named Sandy Davidsen to the sidewalk for no apparent reason. B.C.’s Office of the Police Complaint Commissioner then colluded in a cover-up with Vancouver Police Professional Standards. The cover-up ended only when media learned of Robinson’s actions, no thanks to the OPCC or VPD. Now, with a looming October 6, 2014, public hearing for Robinson, a very awkward event approaches—not only for him, but for those who tried to hide his actions. This page was updated following the Robinson hearing’s conclusion. Will there be another delay? Robinson shoved his victim back in June 2010. In November 2013, when B.C. police complaint commissioner Stan T. Lowe finally got around to calling a public hearing, he professed concern about the case’s substantial delays. But Lowe waited until February before setting the hearing date. Then he set the date to October 6, nearly a year after he first ordered the hearing. Even as that date approaches it is, according to the OPCC, “subject to change.” All these delays benefit the OPCC, which obviously wants to evade scrutiny. Update: The hearing started on time but the OPCC didn’t release Oppal’s decision until November 28. Robinson got a few more days tacked on to his suspension. Will the Pivot Legal Society speak up? PLS lawyer Doug King represents the victim. In a February e-mail he informed me that he’ll raise the OPCC’s conduct of this case at the Robinson hearing. That’s commendable of him, especially since the establishment lapdogs at the B.C. Civil Liberties Association won’t touch the issue. Unfortunately the OPCC’s conduct is beyond the scope of the Robinson hearing and can play only a peripheral role, if any at all. Update: King not only went back on his word but actually praised police complaint commissioner Stan Lowe’s handling of the case. That confirms King’s status as a poverty pimp lawyer who manipulates his clients’ cases for his own establishment ambitions. Will Stanley fix it with Wally? With the full knowledge of his boss, deputy police complaint commissioner Rollie Woods lied to the media when he stated that the Robinson hearing will also be a hearing into the VPD Professional Standards officers. That puts pressure on the OPCC to try to manufacture some semblance of truth to Woods’ whopper. Police complaint commissioner Stanley Thomas Lowe, probably B.C.’s most obviously corrupt public official, appointed establishment lawyer Wally Oppal to preside over the hearing. Given the willingness of one Law Society of British Columbia staff lawyer to lie on Lowe’s behalf, people might be forgiven for extreme cynicism about B.C.’s legal establishment. Will Lowe get Oppal to go over the OPCC’s conduct lightly? Will Lowe get Oppal to either exonerate the agency or issue a very mild rebuke? Update: Oppal repeated the same mild rebuke to the unnamed VPD Professional Standards officers that appeared in Lowe’s Notice of Public Hearing. But the proceedings proved Woods’ whopper to be entirely false. The Robinson hearing was a hearing into Robinson only. Woods lied when he claimed otherwise, but once again got away with lying. 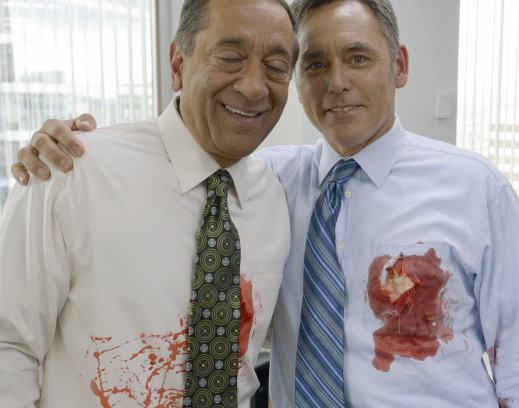 Wally Oppal (left) took time off from the Missing Women Inquiry to act in a slasher movie. How will Oppal conduct the hearing? Should the handling of the Robinson case by VPD Professional Standards and the OPCC come up at the Robinson hearing, will Oppal try for a repeat performance? Update: The conduct of VPD Professional Standards didn’t come up at the hearing, even as a peripheral issue. Will the media pay attention? They will to Robinson’s actions. But don’t be surprised if journalists give Stan T. Lowe and his corrupt crew of ex-cops a free ride. With few exceptions, that’s standard procedure for B.C. media. Update: Lowe and his crew got off again, despite the info I provided to the media. Even the Georgia Straight went disappointingly lamestream. in a reformed system of police accountability? No way. In another jurisdiction, an ongoing scandal like Lowe and his crew might be a catalyst for change. But every MLA in both of B.C.’s main parties supports the police oversight status quo, corrupt as it is. So do, by implication, our “official” activists at the BCCLA. So does, presumably, a very powerful police lobby. As for our “fearless” fourth estate, most B.C. journalists couldn’t care less. Update: Nothing to add here except that King’s brown-nosing remarks about Lowe demonstrate that Pivot surpasses even the BCCLA as an establishment lapdog.